Faizal Khan shares his views about where to find an authentic Indian atmosphere; which restaurants offer real Indian cooking, and how far they're similar to the real thing in India... and why not all Indians practice yoga. “I first arrived here in Moscow five years ago, and soon made plans to stay. I'm a freelancer – I run training sessions for large corporations, I run marketing campaigns and entertainment events. No matter how crazy it might sound, Moscow continuously reminds me of India. For example, when I watch people hawking stuff on public transport or on the Metro – that's the authentic Indian approach. Or the outdoor markets where you see old babushkas selling whatever they can. We have loads of those in India – people selling stuff, maybe they've rigged the scales a bit, with a crowd bustling everywhere. Moscow's just the same! I love going to the local markets – more fun than traipsing through shopping malls. The most Indian places in Moscow are its temples, I'd say. Like the Sikh gurudwara at Nagatinskaya – where anyone is welcome, and they'll even treat a visitor to a meal. Another one is the ISKCON Temple at Dinamo. I was amazed how many Russians go there, when I went there myself recently. And the Russians there try to look Indian! There are Russian girls in saris and with special make-up, people are dancing and praying to Krishna. There were about three or four Indians in a crowd of three hundred Russians – I was astounded! Who are all these Russians there? They're looking for peace, and trying to find themselves. I guess everyone's on the look-out for something which isn't much like them – opposites attract. Maybe that's what draws Russians towards an unfamiliar Indian culture? Russians love Indian food, and it's not hard to find Indian restaurants in Moscow. I've been to several, including Khajurao, Darbar, and Namaste. There's got to be at least ten Indian restaurants, if not more. Not all of them are entirely authentic – they serve Indian food tempered for Russian palettes, and not as served for Indians. I'm not just talking about the spices here – but the taste. Even so, for cheering me up, and curing homesickness, they're fine for me – and incidentally, they always serve me for half-price! But if you want my advice, the best Indian food in Moscow is as a guest in an Indian home – we just love cooking! I often have guests over. When I first arrived in Moscow, I turned up with two suitcases – one with my clothes in, and the other jammed full of spices! But now I know that you can get nearly all the main spices in Moscow's big supermarket chains. I had no idea before I arrived – I even brought salt with me! Of course, the Indian restaurants in Moscow try hard to maintain the cuisine they serve back home – but they more often succeed in getting the style and décor of the interiors right. Sometimes they veer off in bizarre directions. I was in a nightclub the other week. When the DJ saw me, he started playing Indian tracks – he had a huge collection of them, I could even make requests. It was great, and I really felt like I was back at home. It's pretty obvious that Moscow's architecture isn't much like anything in India. Even so, there are similarities. Most Russian churches have cupolas, which remind me of the Persian style of architecture – there's loads of Persian influence in Indian buildings. Just take the Taj Mahal, in my native city of Agra, for example. You can even buy authentic Indian clothes in Moscow – there's a shop off Sretenka, next to the Indian Spice shop. 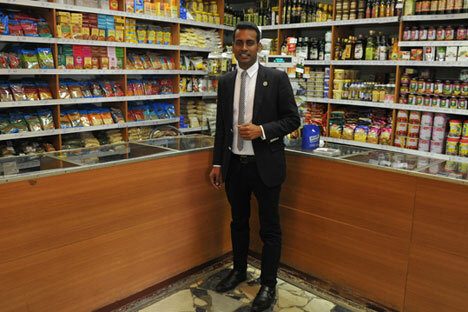 Someone told me there's an Indian shop at Yugo-Zapadnaya too – where there's a whole Indian community established. You can also get Indian clothing near the ISKCON Temple at Dinamo – although the Moscow prices are pretty exorbitant. But you know, I can't say much about the Yoga-Centre. Wherever I go in Moscow, people start asking me if I know Jimmy-Jimmy, or if I watch Bollywood movies, or if I do yoga? Actually, not all Indians are into this stuff. I must have nearly six hundred relatives in my family, and only around three or four of them are into yoga. It's not something I do myself, and in fact not many Indians do either. We don't need all that additional positive energy – we're born with it anyhow!